In this issue of the California Bar Journal, the State Bar publishes the newest acquisition in its public education series, When You Become 18: A Survival Guide for Teenagers. First published by the California Law Advocates in 1991 and revised seven times over the past decade, When You Become 18 is the second in a trilogy of consumer guides to be issued by the State Bar's Office of Media & Information Services. The first, Kids and the Law: An A-to-Z Guide for Parents, appeared for Law Day last May in the Bar Journal, and within a few months all 500,000 copies had been distributed to schools, services and youth programs throughout California. In 2003, the trilogy will be completed with publication of a new Seniors and the Law guide specifically designed for older Californians. The publications in the series are funded by annual generous grants from the Foundation of the State Bar of California. This past year, the foundation board, an independent body from the State Bar which awards grants and scholarships, voted to provide a minimum of $50,000 per year over the next three years to sponsor the public education trilogy. "The State Bar is extremely grateful for the foundation support to provide these excellent publications for communities around the state," said Maria Villa, chair of the board committee which oversees the bar's public education efforts. "Kids and the Law provides a great resource for parents and teachers to begin talking with young people about right and wrong and laws which affect them. When You Become 18 is a great resource for teenagers as they embark on young adulthood." 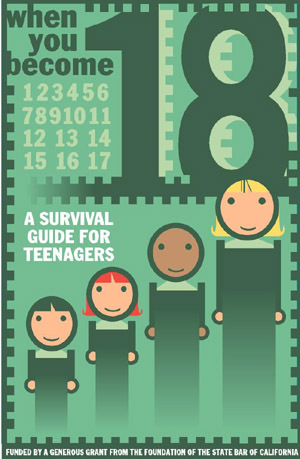 To order When You Become 18: A Survival Guide for Teenagers, please send an e-mail to barcomm@calsb.org or call 415/538-2283. School orders may be placed directly through the California PTA at 213/620-1100. Please pass on the copy in your Bar Journal to teenagers or others who may benefit from this information. An attempt by an Arizona-based lawyer to win the right to vote in the current board of governors election was decisively rejected by a federal judge last month. Louis J. Hoffman, a member of the California bar who sometimes practices here but whose primary office is in Phoenix, had asked for a preliminary injunction permitting him to vote in the current election. U.S. District Judge Saundra Brown Armstrong denied the request and shot down every argument his lawyer, Boalt Hall professor Stephen Barnett, offered. Ruling from the bench, Armstrong said Hoffman "failed to prove a reasonable likelihood of prevailing on the merits." Saying she found no evidence of discrimination against out-of-state practitioners who are members of the California bar, Armstrong said Hoffman has neither a fundamental right to vote in the bar election nor a fundamental right to run for the board, which he wishes to do next year. The goal of State Bar elections, she added, "is to guarantee local representation. . . .Those with their principal offices in California are more interested" and affected by the State Bar's activities than those who practice outside the state, she said. In what is shaping up as the most hotly contested race for the State Bar Board of Governors in recent years, 15 candidates are vying for five open seats. The issues are wide-ranging and include some old standbys - what do the members get for their dues, does the bar spend its money wisely and are its activities relevant? - as well as a couple of newer concerns, such as the widespread practice of law by non- lawyers who prey on immigrant communities and the bar's new diversion program for alcohol- and drug-addicted members. A State Bar task force unanimously recommended last month that the board of governors authorize the conference of delegates to reconstitute itself as a separate, nonprofit entity. Both bar and conference representatives pronounced themselves pleased with a step that will almost certainly lead to a divorce between the two organizations by next fall. At its meeting early this month, the board also will be asked to authorize a statutory change to permit the bar to collect fees for an independent conference through the annual dues bill sent to all members.